Content: Grab yourself a Bluetooth portable speaker and enjoy your music wherever you happen to be. On your terrace, at the office or in your car; anywhere is the perfect place for these 2x3W premium stereo sound speakers. Five hours of continuous playtime are yours for the taking. 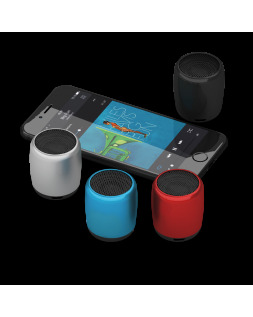 This portable speaker also has other advantages and includes an integrated bass amplifier, a hands-free call function with integrated microphone, and micro-USB cable. Goo's Bluetooth mini speaker combines a colourful design with an ultra-light weight of just 47 grammes. With a four-hour battery life and compatible with all Bluetooth-enabled devices, speakers in this ultra-compact range are easy to pair with your smartphone, tablet or laptop. They also double as a microphone and can trigger a camera. Finally, why not check out our mobile phone kit, which includes a power bank for smartphones and a mini Bluetooth speaker? Goo Connect also brings you a range of wireless headphonesdesigned for people who practice sport or who want to enjoy their music while on the move. 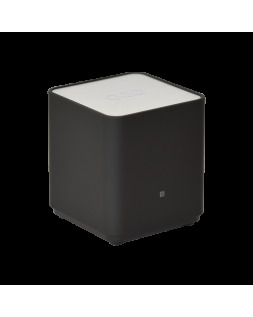 Go for our stylish 2x3W speaker. This mini Bluetooth speaker (47 g) whose power will surprise you over and again (3W) lets you enjoy four hours of play time.